If you have a big garden and you enjoy maintaining it, then you must know that along with a lot of hard work, time and patience also goes garden waste. There is a lot of grass cutting, dead leaves, plant trimming and pruning. You need to learn how to dispose of your garden waste appropriately. You can dispose of small amounts of your garden waste into standard garbage bins or recycling bins intended for green waste but disposing of huge amounts of green waste can be tricky. You will end up with piles of green waste after seasonal clean outs, for example. However, where there is a problem, there is a solution as well. There are few simple ways to dispose of your green waste effectively and easily. One of the easiest and most productive ways to dispose of your green waste is by recycling it. First, you need to have a green waste recycling bin. You can apply for a free one by contacting your city council. However, the problem with these bins is that they are limited in size, which means that you can only dispose of smaller amounts of green junk. So, if you have large amounts of green waste of which you need to dispose, you just have to do it gradually. Unfortunately, this process might take weeks, even months and the collection of the waste is usually carried out on a fortnightly basis. Contact your local city council to find out more information about this service. You should hire a professional and reputable junk removal company in Dagenham RM8, RM9 if you have large amounts of green waste. These companies offer flexible services that will fit your needs. They also offer green waste recycling bins but these are usually two or three times larger than those offered by your local council. This way you can dispose of all the green waste in your garden. Another advantage of hiring a licensed and reliable garden waste removal company in London is that they are flexible, which means that you can arrange for weekly collection, fortnightly or have them collect the waste every 4 or 8 weeks. You can choose the collection schedule that will fit your needs. Not to mention that such services are affordable and can fit any budget. Additionally, green waste experts will provide you with useful tips on how to improve your garden, make compost and other. 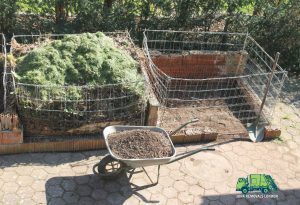 Composting is not the simplest way of handling your green waste but it is good for the environment and your garden. A final product is a natural fertiliser that will feed the soil with organic nutrients. Your garden will benefit from the compost, so make sure you do it right.